Just his magical staff, which is tucked into the 'sleeve' of fur around his wrists when he isn't carrying it. Pokédex Entry "It gazes into the flame at the tip of its branch to achieve a focused state, which allows it to see into the future." History Living in Kalos were two brothers, Jason and Shaun. Each of them had a Delphox, one male and the other female. Rather than battling, the two Pokemon had a desire to become mates, and so their Trainers dropped them off at a Pokemon Daycare for some...alone time. Surely enough, when they returned, two eggs had been laid. One of the eggs hatched into a Fennekin possessing very oddly-coloured fur; many shades of blue instead of the usual orange and white. The other newborn had normal colouration. Both were male, and they were named Orion and Sirius respectively. Sirius, the normally-coloured of the two, grew attached to Jason first. The young man was laid-back yet seemed to know more about raising Pokemon than his younger brother did. Not only that, but he was kind to the young Fennekin as he started to grow up, giving him Poke Puffs and sending some of his other Pokemon out to play with him. Surely enough, Jason and Shaun decided to set out on a new journey, each with a Fennekin. It didn't take Sirius long to choose Jason, whereas Orion, his shiny brother, was left with Shaun. Sirius never forgot the rueful look his brother gave him as they said their goodbyes and set off on their journeys. Sirius had a blast, to say the least. Jason caught many other Pokemon in the Kalos region, all of which Sirius became friends with. The young Fennekin grew quickly, and had evolved into Braixen by the time he was a teenager. He was determined battler, always eager to learn and improve, and the encouragement from Jason only upped his resolve. He became one of the key members of Jason's team, winning many a battle alongside his comrades. From time to time, Jason met up with Shaun and the two of them discussed what they had been doing on their journeys. Sirius was pleased to see Orion again, but the shiny Braxien often looked a little worse for wear; tired-looking with untidy fur, and a sombre expression on his face. Occasionally they battled one another, but Sirius was almost always the winner. It was odd to think, but Sirius didn't think his brother was very good in battle at all. On one occasion when they met up, he asked him if everything was OK, to which Orion snapped back that it was, and that it wasn't any of his business. Not convinced, Sirius rejoined his Trainer, casting a rueful glance back and wondering if Shaun was treating Orion correctly. 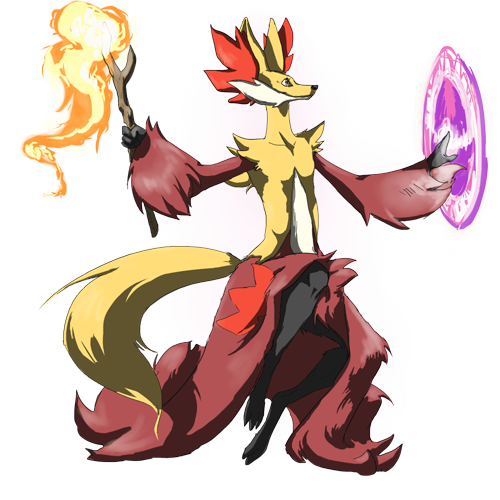 A few years past, and Sirius evolved into a powerful Delphox by the time he had reached adulthood. Jason managed to get his hands on a couple of TMs, and taught them to his Pokemon as a reward for reaching his final evolution. Life couldn't have been better...yet he always kept wondering how Orion was doing. Eventually, Jason met up with Shaun once again and the two started to discuss leaving Kalos to go explore another region. While this was going on, Sirius spoke with Orion again but the shiny Delphox still snapped and refused to talk. Worried, Sirius accompanied his Trainer to the Hoenn region, and the brothers said goodbye once again and set off in opposite directions. However, a few months into their journey, the epidemic hit. One night, Jason released all his Pokemon from their Poke Balls and told them to run, as far away as possible. He didn't say why, but he looked terrified. Sirius protested, but eventually obeyed, and surely enough he soon found out that a terrible virus was sweeping through the regions and turning Pokemon into undead, flesh-eating monsters. Sirius feels awful for leaving Jason, even though he was oblivious to the situation at the time. However he is slowly adapting to living by himself, keeping himself strong by battling the undead. His wanderings have taken him into the ??? region, where his fairly boring and dull life is about to take an interesting turn. Appearance An ordinary Delphox to most, Sirius has managed to maintain his well-groomed appearance throughout the epidemic; he hates getting dirty and will clean himself at the first opportunity should things get messy. He holds himself tall and proud, sometimes with a bit of a smug look to him, and has a very calm temperament; very rarely does he get visibly fazed. Personality The initial impression that most people get of Sirius is that he's a nice guy. He's laid-back, fairly polite and protective of those he cares about. Sirius is a sociable Pokemon who does much better in a group than he does by himself. He's charismatic and intelligent, and is overall a valuable addition to any team. His calm demeanor means that he rarely gets visibly fazed by a situation other than an undead attack. While calm on the outside, however, Sirius's head never shuts up. The Delphox is constantly thinking to himself, about everything he sees and does. He is usually quite a good judge of character, but keeps anything negative he sees in anyone to himself unless he is proven right. Speaking of, he loves being right, so be prepared to hear, "I told you so!" from him every now and again. Sirius can't get it into his head that there are Pokemon around in the epidemic who never had a Trainer. In his eyes, only those with special training could ever hope to survive the apocalypse. He is aware that he received such training himself, and holds onto that fact proudly. It is not uncommon for him to look down his nose at weaker Pokemon, wondering why they haven't been eaten yet. He's quite vain, becoming irritated if his fur gets too dirty or his pride is splintered in any way. Deep down, though, Sirius is a sensitive soul who looks upon the state of the world in despair, and the undead frighten him greatly. Like all Delphox, he can gaze into the flame of his branch to view visions of the future, but he rarely does this, simply because he is afraid of what he might see. He wonders a lot about his brother, Orion, and hopes that he is safe and that he will one day see him again. To inactive for now please.